Please visit our new blog, Happily Ever Expat! I’ve taken thousands of photos in really amazing places, but this one is my absolute favorite. I realized this as I was going through some of my photos and came to this one. As soon as I saw it, I filled with joy and pride and I could remember the exact moment that I took it. Dave and I were on a trip with his parents in Kyoto. We split up with them for a bit because I wanted to head to Gion to see the geisha and maiko. 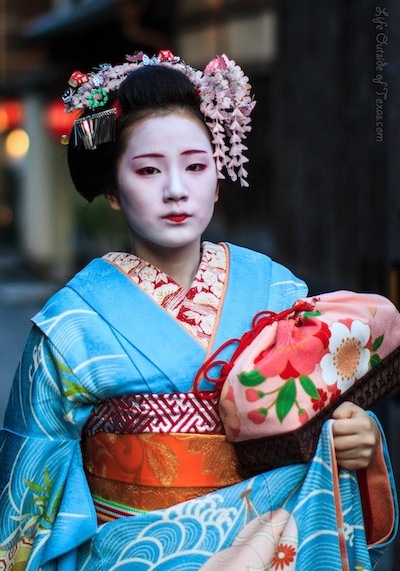 We spotted this gorgeous maiko in an alley just behind the old famous geisha school in Gion. We had been perched there for ages, waiting patiently, as if we were stalking our prey. We spotted her from a ways back and tried to contain our excitement so that we could get a photo before the other tourists could block our shot. She walked expressionless and looked into my camera as I took her photo. Out of all of the places I have been, this moment and this photo is by far my favorite. Follow our ordinary family as we try to live an extraordinary life through travel at Suitcases and Sippy Cups. And on twitter and Facebook. This photo was taken in St. Mark’s Square in Venice and is a snapshot of everything I love about traveling with kids. Here we are, in this iconic square, surrounded by inky, black canals and golden sunlight, but the most beautiful thing for miles is the joy on the faces of my children as they fully experience the joy of feeding the pigeons. This picture is perhaps even more poignant because, shortly after we visited, feeding the pigeons was outlawed in St. Marks square. This picture reminds me to live every moment to the fullest, for you never know if you will get another chance. Follow Jess as she travels the world always looking for new adventures while attempting to control her wanderlust at A Passion and A Passport (blog), Twitter, and Facebook. This photo was taken in Oia, Santorini, during our Greek Island honeymoon last summer (2012). I just love this photo, I really do. Brings back some great memories, and it was taken around the time I began to really start enjoying photography! The composition may be a bit off, but I love how the path leading down gives the impression you are going straight into the water. Much of our honeymoon was spent in the water, so it’s a perfect fit! 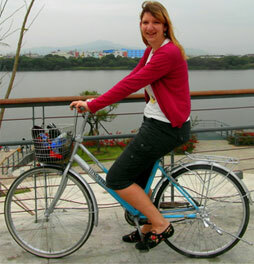 Agness is a Polish vagabond who, after graduation, left her comfort zone and set off for a journey of her lifetime to China in 2011. She has been constantly travelling the world since then (slowly, but surely as she says), living like a local for less than $25 a day. Follow Agness on her blog, eTramping, on twitter and Facebook. One of the first places I was lucky to explore in China was Fenghuang – one of the oldest Chinese towns ever. I took a boat and I was admiring the incredible scenery for hours. Since that day, I love to explore every country/city/town by boat if possible (Fenghuang, Hunan province, China). You can follow her journey on Facebook, Twitter, YouTube, Pinterest and Instagram also. International wildlife is a passion both myself and husband Mike share, and this photo depicts one of Florida’s Black Racer Snakes devouring his favorite form of lunch! The frog desperately clings to a nearby blade of grass in a last minute attempt to save his life, however at this stage there is no hope left for him! There are round 50 species of snakes found in Florida, however only 6 are venomous and dangerous to humans. The majority of snakes including this black racer are harmless and are protected as they play a beneficial role in natural ecosystems, eating insects, rodents, rabbits and, as you can see in this photograph, frogs! We were lucky enough to snap this photo as the majority of snakes in Florida are not actually aggressive – and chances are they’re not going to attack in the middle of a meal! Wanderlusters: Freelance writer and blogger Charli is a digital nomad currently travelling the world with her other half Ben. Whether backpacking through Central America or road tripping around Australia they embrace each and every opportunity for adventure. Follow their blog, Facebook, Instagram and Twitter. I took this shot in the Parque Colon in Granada Nicaragua. It was out third day in the city and I had yet to take a shot of the street children who had already featured so heavily in our experience of Nicaraguan life. I think I was concerned I wouldn’t be able to capture their spirit, innocent yet wise beyond their years. They appeared so fragile and alone yet terribly strong. Bennett has spent over 21 months living and working in China and is ready for her next leap into the unknown in New Zealand. You can also find Bennet on twitter and Facebook. I took this photo on 29th December 2012. It overlooks Piha beach, before the road meanders down the hillside to the beach. To me it sums up my time there over Christmas 2012, the waves, the beach and the too-hot-to-walk-on sand and especially the red Pohutekawa flower which only flowers around Christmas. I love this scenery and can’t wait to get back there in September! This photo is from my trek to Everest Base Camp. 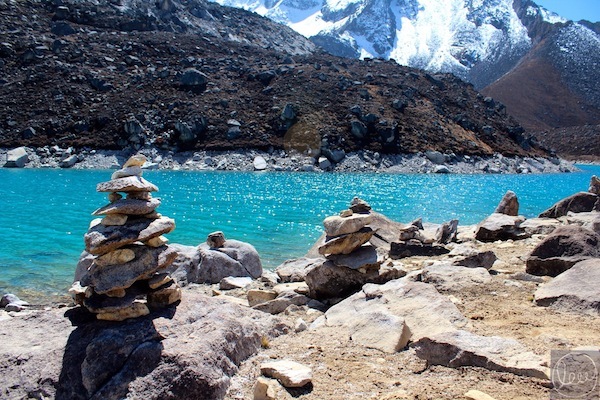 The lake was at Amadalblam Base Camp – a huge challenge to get to. Almost vertical for a few hours! But what a reward. This was high up on my bucket list and one of the few with a deadline – I wanted to complete it before I was 30. And I did! There are so many great memories from the trip. I will never forget the challenge, the achievement and camaraderie. The Himalaya are an awe-inspiring place and I’m glad I experienced a piece of it. You can read the entire post about Lew’s Everest trek here. How one couple quit the American Dream and went after their own. You can also find AfterGlobe on twitter and Facebook. While snorkeling in the waters of Maui, we swam with this Honu (Hawaiian for sea turtle). Every time I see this picture it puts me back in the water, doing something I love in one of my favorite places in the world. It’s complete peace. 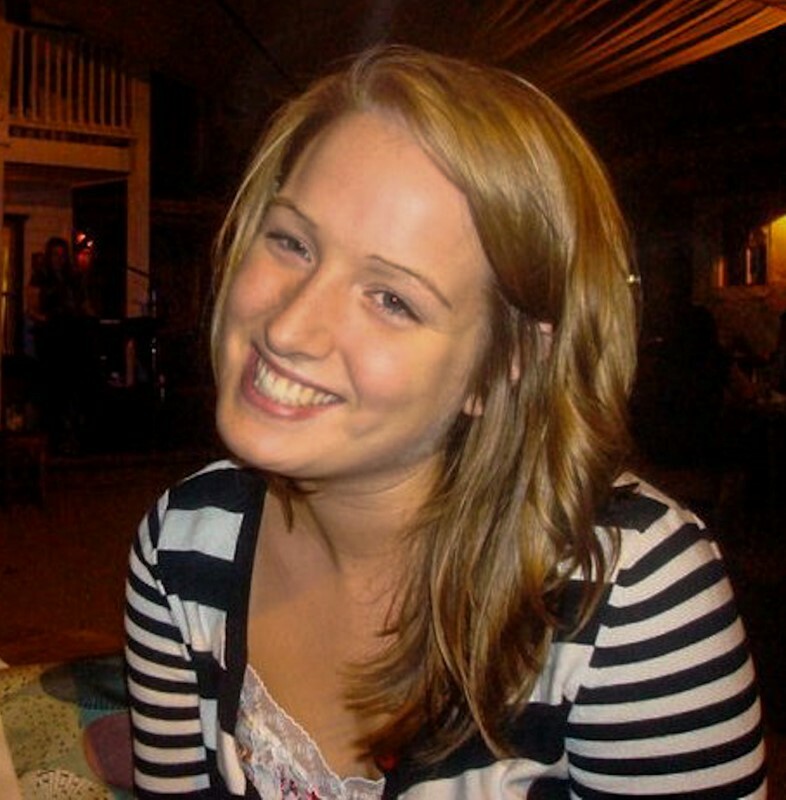 Hey, I’m Jill Osteen, an avid blogger and 32 year old Southern California native, who’s spent the last 4 years living and teaching English in South Korea. I found the love of my life and now my husband, (who’s from North Carolina), in South Korea!!! We’re back in America and on a 2 1/2 month road trip across the US! We own a wedding / lifestyle photography business as well, Aaron Nicholas Photography. I can usually be found with my Nikon D700 tucked away in my over sized bag somewhere, ready for the perfect opportunity to snap a photo for a new blog post! You can follow Jill’s incredible life through her must-see blog, Instagram and Pinterest. My husband loves to photograph sunsets, so while we were in Jackson Hole, Wyoming (The Grand Teton’s National Park) I decided I’d come along for the sunset adventure. We parked the car and walked through the forest (dodging deer and buffalo) for a good mile or so before we reached this AMAZING spot to watch the sunset over the Teton Mountain range, along the snake river! Do you have a favorite travel photo? I’d love to see it! Leave a link in the comments or email it to me. This entry was posted in Photography, Vacations and tagged Amadalblam Base Camp, Auckland, Base Camp, Beach, Black Racer Snake, children, China, Everest, feeding the pigeons, Fenghuang, Florida, flower, geisha, Gion, Granada Nicaragua, Grand Teton’s National Park, Greece, Greek Island honeymoon, Hawaii, Himalaya, Hunan province, Jackson Hole, Japan, Kyoto, lake, maiko, Maui, New Zealand, ocean, Oia, Parque Colon, photography, Piha Beach, Pohutekawa, Santorini, sea turtle, snake eating frog, snake river, snorkeling, St. Mark’s Square, sunset, travel, trek, Venice, wildlife, Wyoming by Meagan & Dave | HappilyEverExpat.com. Bookmark the permalink. Thanks for having us be a part of this. It’s fun getting to see everyone else’s pictures. Thanks for participating! I absolutely love the photo you submitted! Love this! They are all such great photos 🙂 It’s so fun to see a piece of everyone’s travels all together in one post! Thanks, Jenna. I was really amazed by the photos I received. It’s almost like going on a round the world trip, isn’t it? Thanks, Jessica. I think you’re right. Looking at this old post has convinced me to do another one! Wowee, what a great collection, love the one of the snake and the frog. Poor little chap. Thanks so much for participating, Charli! Love your photo as well. Great collection of photos from awesome bloggers! I’m sorry I missed contributing to this one, but let me know when you do it again. Loved it! JR, I’m thinking of doing a best of Asia post next. I know you’ll have something amazing to contribute! Yeah, each blogger has their own unique style and it’s interesting to see what is most memorable to them. Thanks for reading, Karisa! Tried to comment earlier, wordpress hates me?! Thanks for contributing, Sarah! Hope you’re still having an amazing time in NZ. I’m looking into doing a best of Asia post as a follow up so I hope you’ll consider contributing again! What a fabulous post! I wanted to share a photo from my 2012 Bike Trip … but … I’m not smart enough to figure out how to make a link to a photo. How pitiful is that 🙂 Anyway, imagine the reflection of trees in the waters of the Ocoee River in Cherokee National Forest! I’d love to see that! Please send me a link if you figure it out. This is an awesome collection of really different pictures! LOVE the picture of Agness on the boat in China! I adore that photo! She’s so cute and the fog around here is breathtaking. Thanks so much for commenting, Kathleen! There are some amazing photos in that collection…loved the stories behind them too! What a great collection! Every photo is a gem! Thanks for including my shot! Thanks for submitting a great photo. I absolutely love the expression on the little guy’s face! What an awesome idea for a blog carnival! These are all spectacular photos. Thanks for introducing me to a few new bloggers, too! Thank you so much for reading and commenting! There are some really amazing bloggers in this group. Glad I could introduce you to a few of them. I’m really impressed by all of the photos. They are all special and amazing! Well done to us :). Thank you so much for having me there. It was my pleasure to share one of my favourite photos from Fenghuang with you. Megan, what a great snapshot!!! WOW!! Thank you so much for the lovely comment and for contributing. I really appreciate it! Agness, I’m thinking about doing a best of Asia follow up and I’d love you to submit your best photo. Can’t wait to see it! Thanks, Raphael! I’m really looking forward to seeing your Kyoto photo. Amazing post and photos! Maybe someday my wife’s photos (on my own site) will make your hall of fame. I’d love to feature one of your wife’s best photos of anywhere in Asia in my next collaborative post. Send me a message on facebook if you’re interested. This is a beautiful collection! One more all-time favorite was in Boston, MA Public Gardens. It was autumn and is typical of the area, the turning of the leaves was incredibly beautiful. I was shooting everywhere. Then I saw her… This tiny little girl in her pink outfit arms out embracing the wind. She looked so small compared to the tree. When you focus on her in the photo, though, she becomes the centerpiece. Please keep sharing! I love to see other traveler’s moments frozen in time. Great photos! I’d love to visit Amsterdam. My boyfriend is half dutch so he still has a lot of family living in the Netherlands. And the pic in Boston is lovely. I love fall and it’s so much fun to see people stopping to take in the beauty of a moment. Thank you so much for sharing these with me! I missed the maiko when I was in Kyoto. They must’ve known I was coming and wanted a photo. Yours is gorgeous though. Thanks, Christine! The maiko were my absolute favorite part about Kyoto. They’re so beautiful. Because you have to wait around for a while to see one, it feels really gratifying to spot one and to get a good photo. We actually found the perfect place to wait and a few times we were able to get photos before anyone else saw them. Some fantastic photos! And new blogs to follow. We were just in Kyoto in January, and while we saw a few maiko, I didn’t attempt to get any pictures except for behind. I still feel really weird about taking peoples photos! It just seems so intrusive, unless I can ask them for a photo in their language. I’m glad you did though, that photo is gorgeous! I feel really weird taking photos of people too. In this situation I wasn’t bothered because people were lining the streets like paparazzi. I think it’s an occupational hazard for them. I have a few other photos of maiko. One of these days I’ll do a post about them. Love these! You got some really incredible shots from your friends. The Santorini one makes me want to get on the next plane their right now! Thanks, Jessica! Anytime I need motivation to travel, I come back to this post. I can certainly see what you mean about the Santorini pic. It really makes me want to go there too!. Great pictures, everyone! Excellent job compiling them, each of these makes me want to leave Korea 😉 I’ll go through and find one from my collection, hopefully it’s up to par! Thanks so much for sending me your photo. It’s a good one! Wonderful pictures by all, also thanks for showcasing some blogs I hadn’t seen before. Pictures really are worth a thousand words, but these might be worth more like a million. The one in Jackson Hole is absolutely stunning. That photo is one of my favorites of the whole bunch. A girl I met in Korea took it. Her and her husband are now professional wedding photographers, and all around great people. Oh man. This is amazing! I kept staring at the first photo & the one of the little boy with the pigeon on his head SO perfectly captures joy. These photos really do remind me how beautifully a moment can be frozen in time and take you back to that time and special place. How wonderful!!! Thanks, Elicia. I love good photography and agree with everything you said. It’s so nice when a photo captures a special moment! Absolutely beautiful! All the photos are stunning, and I love the little stories with it. Thanks, Liz! I’m working on another collaborative post of great photos of Asia if you’re interested in participating. I’d love to have you!